When the weather is nice, nothing is better than getting your little one outdoors to play. 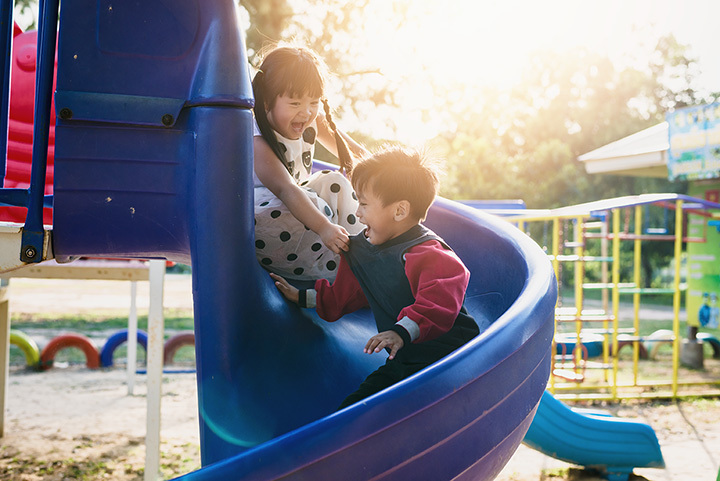 From city parks in Portland to community spaces in Wiscasset, the local playgrounds of Maine provide an excellent opportunity for your child to burn off some energy on a sunny day. Here are the best playgrounds in the state! Children love the equipment and the vast expanse on which they can run around. Ian’s Playground is a popular gathering spot for those living in and around Bucksport. Reiche School Playground is a great place for kids to burn off some steam on weekends and after school hours. The modern equipment keeps them thoroughly engaged and the adults who bring them appreciate the pretty surrounding landscape. Broadway Park is one of Bangor’s larger playground areas. Kids can spend a couple of hours climbing on the equipment and then gather some friends and play a game of tag. The grassy area is huge, and perfect for picnics. Perfect for smaller children, Wiscasset Community Playground has a great assortment of structures on which the kids can play. Situated on a mulch base, it cushions the landing of those who fall. Pack a lunch and eat on a nearby picnic table, and send the kids back for round two! Situated on more than 40 acres, Edward Payson Park includes a wonderful fenced in playground for the kids to enjoy. During the summer months, an adjacent splash pad is perfect for keeping them cool. The lawns outside the playground are perfect for playing ball or flying a kite. Heavily funded by author Stephen King (a Bangor resident), Hayford Park has a giant swing set and some great climbing structures for children to enjoy. It sits adjacent to a modern outdoor pool that is open for public use throughout the summer months. Eastern Park features two playgrounds. The first—for toddlers—is close to the parking lot, so parents and caregivers needn’t carry kids, snacks, a diaper bag and more a long way in order for the children to play. A bit deeper into the park is a playground for older kids. Parents can enjoy the view of the Penobscot River while the kids tire themselves out! Featuring playground equipment for toddlers through elementary school age, Augusta Waterfront Park is a great way for parents to get outside while the kids have fun. Noted for being one of the cleanest parks in the region, the view from the benches takes in the Kennebec River. If the kids aren’t worn out after enjoying the playground, take them for a walk around the adjacent historical fort. Kids love the Nan Jones Kimball Playground. With equipment that meets the needs of toddlers through elementary age, there’s something for everyone here. The giant sandbox is a big draw, too. Located next to the Androscoggin River, Sunny Side Park has a great playground (safely removed from the banks of the river, so no need to worry!) with lots of fun and agility-testing playground equipment. There’s also a basketball court and walking trails for extra hours of fun.